One critique frequently lobbed at American fashion is that it is little more than a sophisticated copycat mimicking European ideas. It’s a lazy assessment, but one that isn’t always entirely without legs. When American design is at its best, when it truly thrives, it is due to the jolt provided by an outsider, or someone who thinks like one, whose work is so powerful it can elevate the pack. 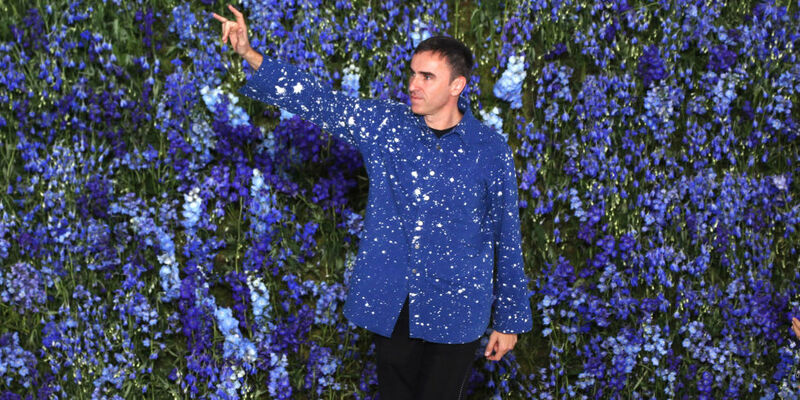 With the announcement of Raf Simons’ appointment at Calvin Klein and his decision to show his own menswear in New York, the American fashion business is poised for just such a shakeup. Though some American designers make the leap to show in Europe like Mainbocher at the beginning of the 20th century or current visionary Rick Owens, the reverse is almost never true. The last time a powerhouse talent from across the Atlantic transitioned Stateside, he turned the entire industry on its head. His name was Helmut Lang. The Austrian-born Lang was showing to great acclaim in Paris when he decided to move his entire design studio to downtown Manhattan’s SoHo neighborhood in 1997 and join New York’s fashion calendar. The New York shows always closed the season further adding to the U.S.’s derivative reputation, so Lang arranged his presentation to precede Milan and Paris. All of his American counterparts followed suit and the experiment has become the standard. If you think of louche punk-inflected black clothes, minimalism and chic reserve when you recall the 90s, you have Lang to thank. But the question at hand is: Will Simons have a similarly profound impact and what might the ramifications of his new post look like? Simons himself has had an unusual career path for someone of his standing. He totally lacks any formal fashion education having studied industrial and furniture design in his native Belgium. While producing work for Walter Van Beirendonck, one of the original Antwerp Six who shocked Paris with their groundbreaking collections a few years prior, he was taken to a now legendary early show of Martin Margiela’s in October of 1989. “I was so struck by everything I was seeing that I started to cry. I felt so embarrassed. I was like, Oh God, look at the ground, look at the ground, everyone’s going to see you’re crying — like, how stupid to be crying at a fashion show. Then I looked around, and half the audience was crying,” Raf told The Gentlewoman last year. 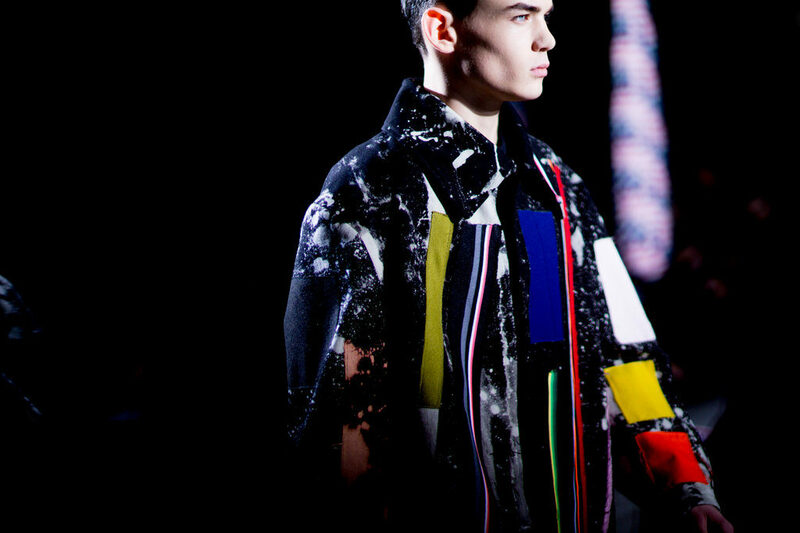 He was so moved by the show’s strange, ethereal, mutant beauty that he immediately decided to pursue fashion. In 1995, Simons launched his menswear line as an underground youth-focused passion project. Steady growth led to a larger audience and numerous accolades along the way for establishing a lean schoolboy aesthetic noted fashion critic Cathy Horyn contends laid the foundation for Hedi Slimane’s lauded tenure at Dior Homme and beyond. 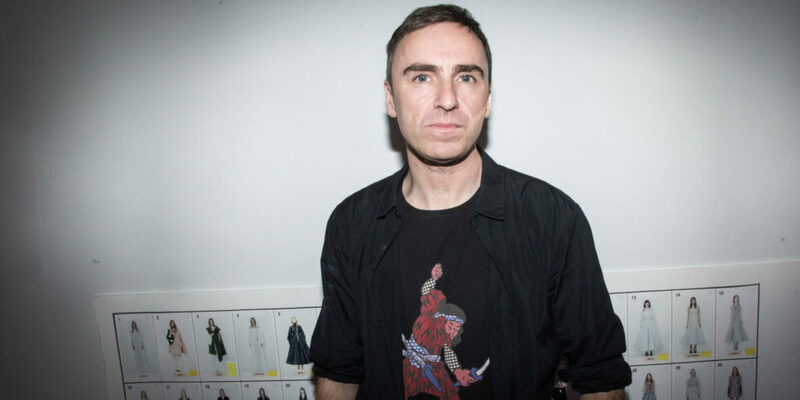 But in another unanticipated turn, Simons was tapped by the Prada Group to take the helm of Jil Sander after the namesake founder completely severed ties over disputes about the how the business should be run. It not only propelled him onto a larger international platform, but he would also be responsible for designing womenswear for the first time. The minimalist roots of the house melded well with Simons’ own sensibility and he spent seven blockbuster years reworking its signature codes culminating in three spellbinding couture-inspired collections before stepping down to take the lead at Christian Dior in 2012. Few people had foreseen such a short term with the iconic French maison, but even huge fans admitted off the record that the fit never seemed to be quite right. His next move was uncertain, but upon the conclusion of his months-long non-compete clause, it was declared he would be the first person since Calvin Klein himself to oversee every branch of Klein’s famous label which is most synonymous with premium denim and luxurious sportswear. It was vindication for his intellectual freedom amid an increasingly money-driven environment fostered by fashion executives and a rare opportunity to implement a holistic vision. The required move to New York also brought with it the happy surprise that Simons would shepherd his boundary-pushing eponymous label along with. The news couldn’t have come at a more tentative time. The industry as a whole is in the midst of remarkable upheaval–rapidly shifting markets, the slowing of the Chinese economy after years of heavy investment, the surge in e-commerce and the uncertainty of supply chains as climate change has affected everything from cashmere to cotton have all contributed to an atmosphere of anxiety which encourages staid design. It is ripe for change and Simons may be more primed than any of his contemporaries to lead with the tremendous depth of his experience heading brands of every size and developing every imaginable product category. The mere fact of his being based in New York will automatically cause the international audience to look at the city with fresh eyes, particularly when it comes to the nascent Fashion Week: Men’s, and inspire renewed focus in the fashion community. But what about the clothes themselves? Menswear in particular is a difficult thing to penetrate being far more conservative and shy of change than womenswear, but Simons has managed to revolutionize it before. The skinny silhouette he established for his own label has proven to be enormously influential, so much so that it would no longer strike a casual observer as odd to see a man with a string bean tie, adolescent-like straight-fitting suit or greatly oversized coat. When Simons first delved into the garment trade, he started by tweaking wardrobe staples like double breasted suits and trench coats to his liking, but now his evolution seems more directly tied in with artistic concepts, something cemented by his collaboration with the prolific artist Sterling Ruby for Autumn/Winter 2014. His pieces are increasingly abstracted, alternately obscuring and enhancing the body through the brilliant manipulation of color and shape, often with the use of technical materials. Where he’ll go next is impossible to say. And nothing could be more exciting than that.